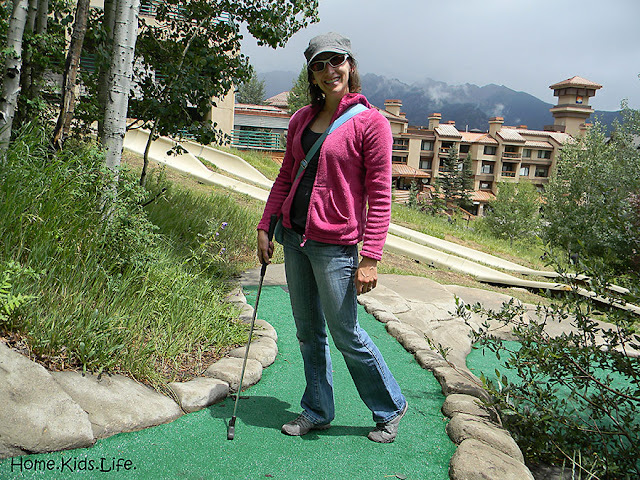 Have you been to Durango, Colorado? We went there for a weekend. We hope to go back soon. So if you have any recommendations for places to go, things to see, and stuff to do....let me know! Durango was the destination because Biker Boy was going to do an epic day mountain bike ride with a bunch of people. 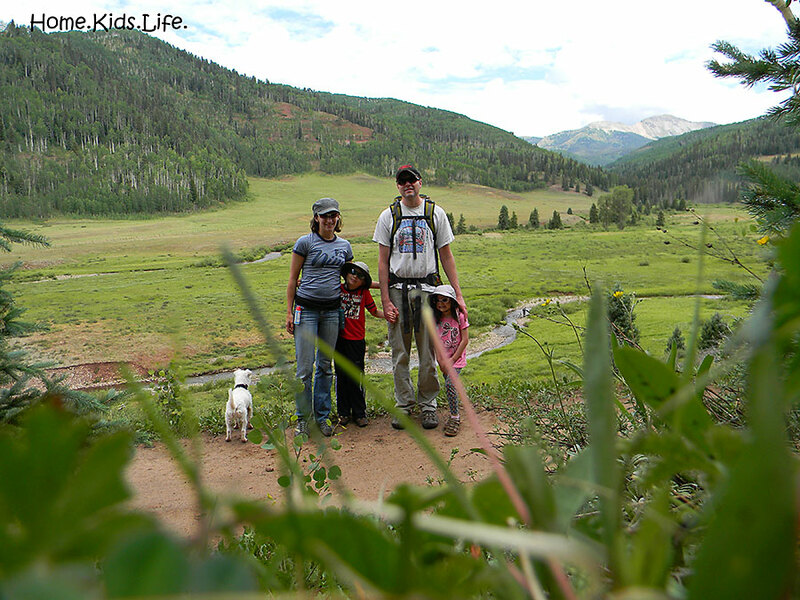 The kids and I were just tagging along for the adventure in it. We were the only family to tag along. We arrived in Durango on a Friday evening. We set up camp near the Durango Mountain Resort (the ski area). Okay, it was 6 miles up a dirt road that we traversed in our 2-wheel drive mini van. Yahoo for the family van. It was muddy. It had rained, so we got to set up the tent on wet ground. But at least it wasn't raining when we set it up. Then we immediately went to bed. We got up at 5am the next morning. Yes, you read that right. 5 in the morning. That also meant waking up a 7-year-old boy and a 5-year-old girl at 5am. They handled it well. We sleepily put ourselves into the van and drove down to the ski area to meet the rest of the biking group. It was raining. So I climbed the piles of sleeping bags we threw back in the van when we got up to locate the cooler and make breakfast. We had to drive the road between Durango and Silverton to get to the pass where the bikers were going to start. It was raining. 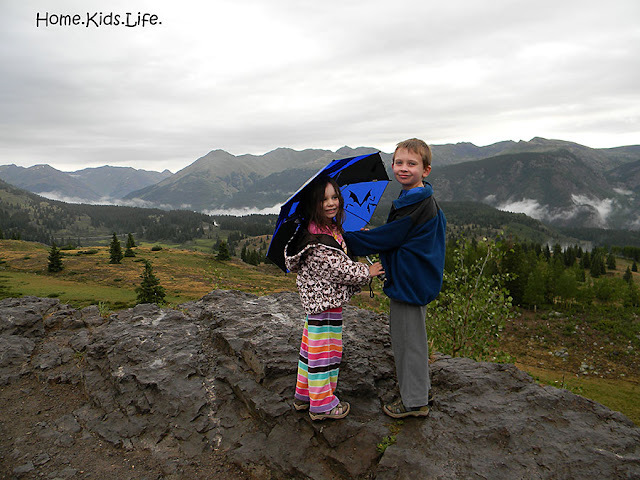 We got to Molas Pass. It was beautiful. It was raining. 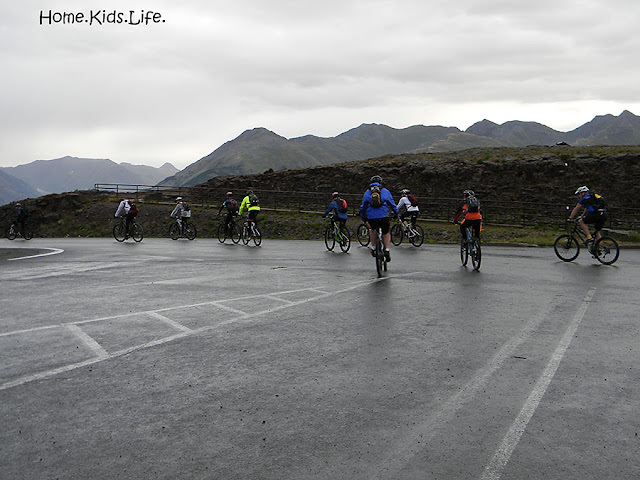 The bikers put on their finest rain gear and headed out to ride a 40 mile ride on the Colorado trail. Let's just say that no bike came away unscathed. Because of all the mud and water the bikers rode through, all of them have repairs. Some even abandoned the repairs and found an excuse to get a new bike! Biker Boy had to replace cables and housings, get a new chain, and even a new crankset. But the bikers had fun and Biker Boy proclaimed it to be the most beautiful ride he has ever been on. Okay, whatever. The kids and I still think we had a better day! 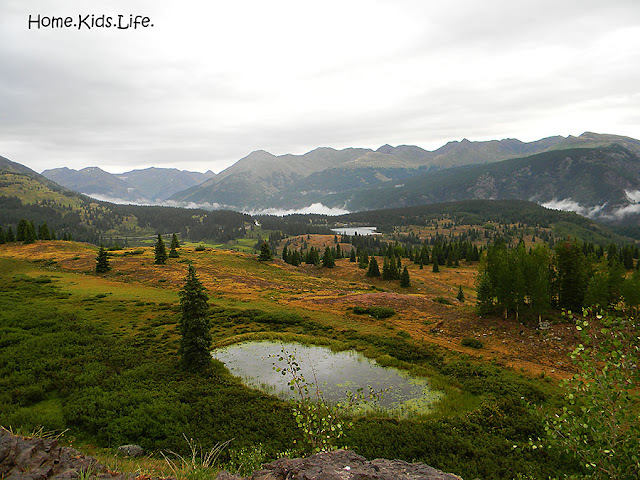 We enjoyed the beauty of Molas Pass for a bit. And the pit potties. And getting dressed in the van because we were still in our pajamas. The kids mostly just liked playing with the Batman umbrella. Then as I was driving down and up mountain passes, I came across a sign for a lake. So this momma decided to be adventurous and detour to the lake. 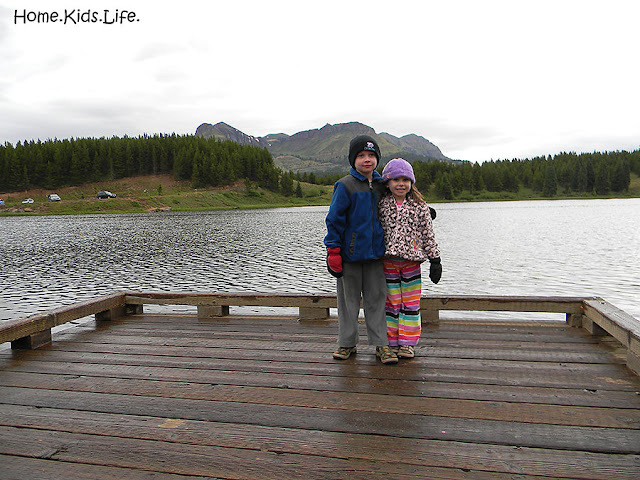 We live in the desert, lakes are hard to come by, and my little ones love being near water. It was a good detour to Andrews Lake. The kids loved it. 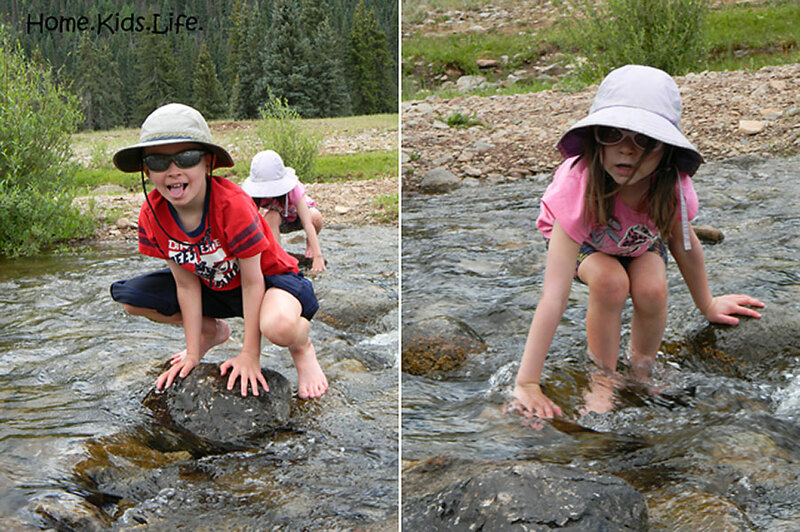 Then threw rocks in the lake, watched ducks, spied leeches in the lake, and only one kid fell in to his ankles. And yes, it was a little chilly at this alpine lake in the wee early hours of the morning. Next up was the trek to Durango. I hadn't actually planned on going all the way to the town of Durango, because it's a hike from the ski area. But I thought maybe the kids would sleep on the drive. Nope. 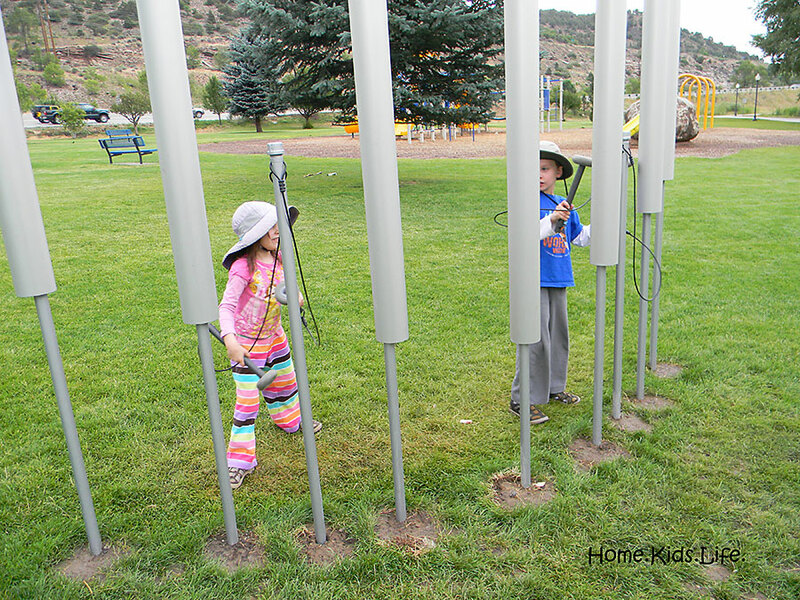 We galloped our way into town and found a lovely city park next to the Animas River. The kids played for nearly 2 hours. We ventured into the visitor center to get some brochures for a return visit. 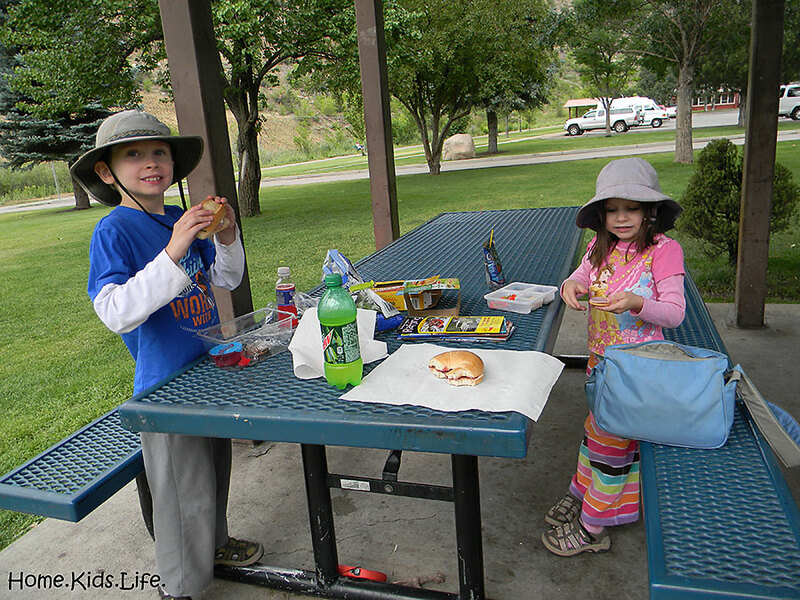 This tired momma then purchased a mountain dew and the kids and I then settled in to have a picnic lunch. Yum.....mountain dew......in the mountains. It was much needed. After lunch we got in the van again and started the drive back to the ski resort, with a few detours. 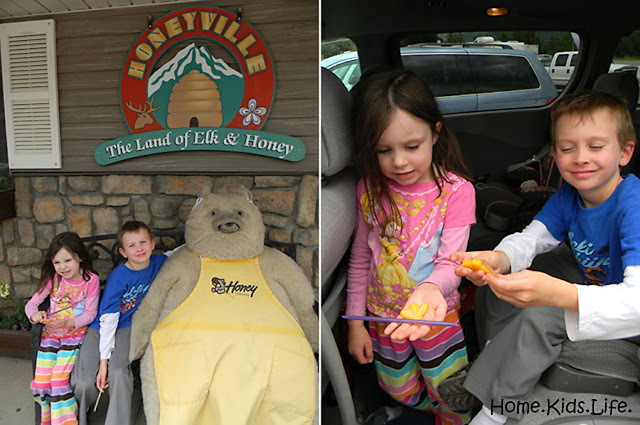 We had picked up a brochure about Honeyville at the visitor center. Scooter noticed that it said Free Wax Bee on it. So we stopped at Honeyville. The kids loved it. I loved it. It was a good stop. We watched bees making honey, we bought honey, and the kids got free beeswax bees for turning in the brochure. (You must turn in a brochure to get the cute little wax bees....and the kind lady actually gave each of my kids one). We also bought some honey in a honey bear, whipped honey, and Chocolate Buzz. I'd totally recommend the Chocolate Buzz if you happen to go to Honeyville. It's chocolate and honey and it's super yummy. Ours has gone fast. After the honey stop we stopped on the side of the road once again. 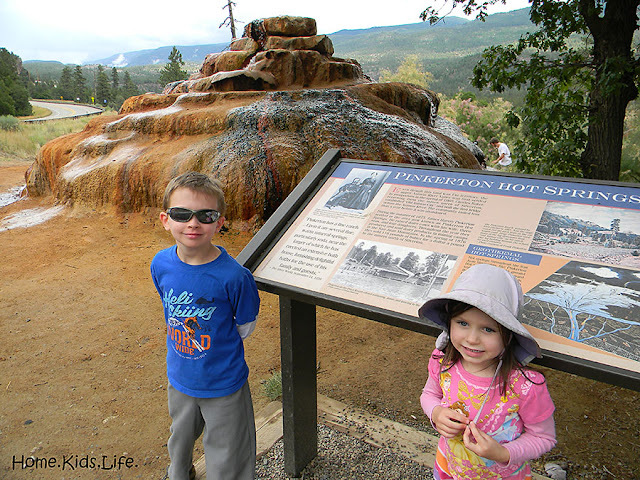 This time we stopped at Pinkerton Hot Springs at Scooter's request. 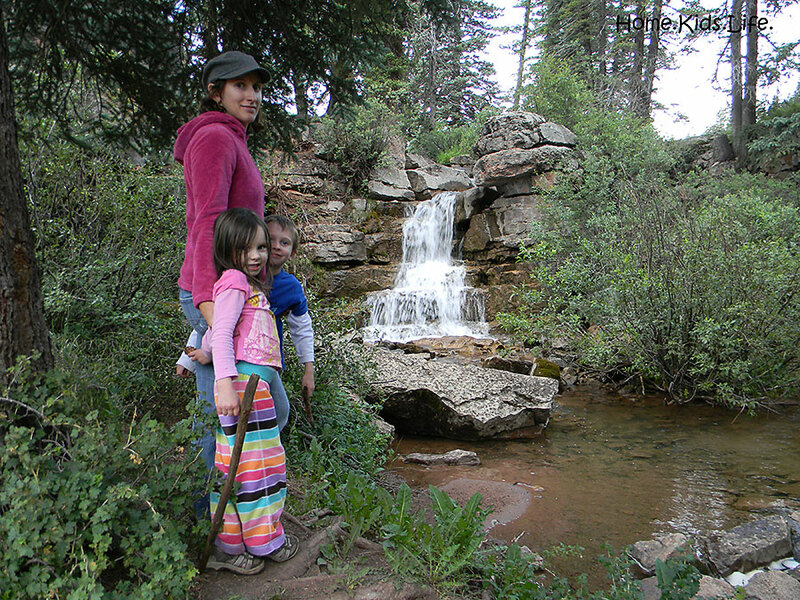 The kids loved exploring around the hot springs, watching the water flow into creeks, and just feeling the warm water. It was a good wet time. Then we ventured back to Durango Mountain Resort while driving through some rain. 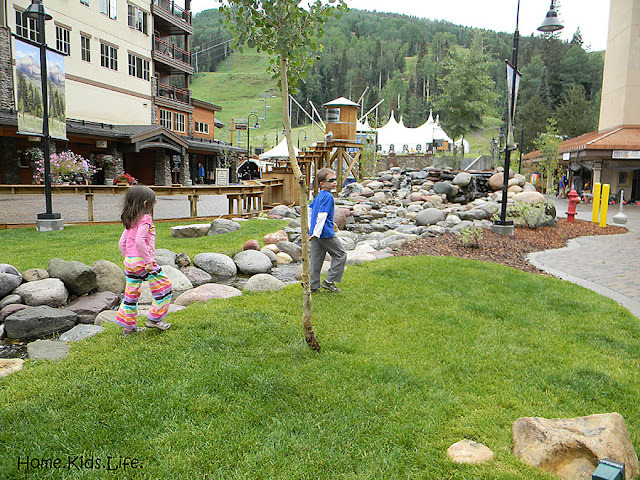 When we got to the resort it wasn't raining. But you could tell it had poured there. The kids and I were going to do some activities there, but they had shut everything down. I went to ask about mini golfing and if we could still do that....and they let us do it for FREE since everything else was shut down for the day. Whoppee!! We did two rounds for free. It was fun. I was totally expecting my little ones to have a melt down at some point (especially the youngest), since we had gotten up early, but both of the kids were so good all day! We then loaded up in the van again and I drove the mountainous dirt road back up to our campsite. 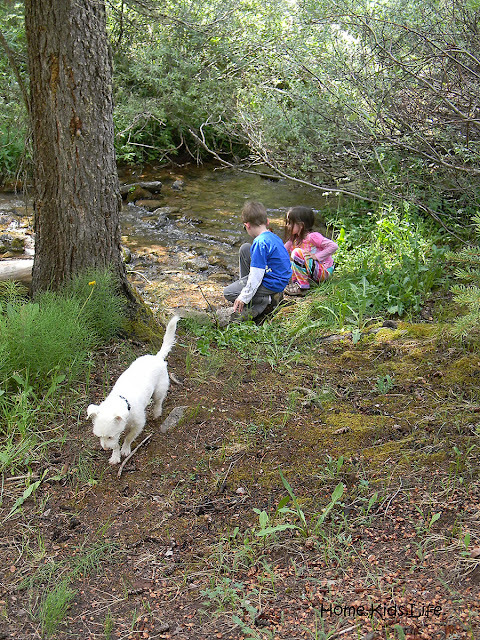 We must have gotten back around 3:30pm and the kids played by the creek next to our tent. The bikers rolled into the campsite around 4:30pm. Biker Boy got cleaned up in the woods and then we enjoyed some dinner together. Then our little family explored around the campsite. There was water and waterfalls, so the kids deemed it a winner. The dog even took a little splash in the creek. On Sunday we packed up camp and headed down the dirt road a little farther to a trailhead near a creek. You're actually suppose to cross the creek in your vehicle to get to the parking lot. But, we didn't want to attempt crossing the creek with our low mini-van. So we parked, took off our shoes and socks, and then crossed in the freezing cold water. The kids loved it. I ran as fast as I could across it because the cold water was painful. I have no idea how the kids lingered in it. 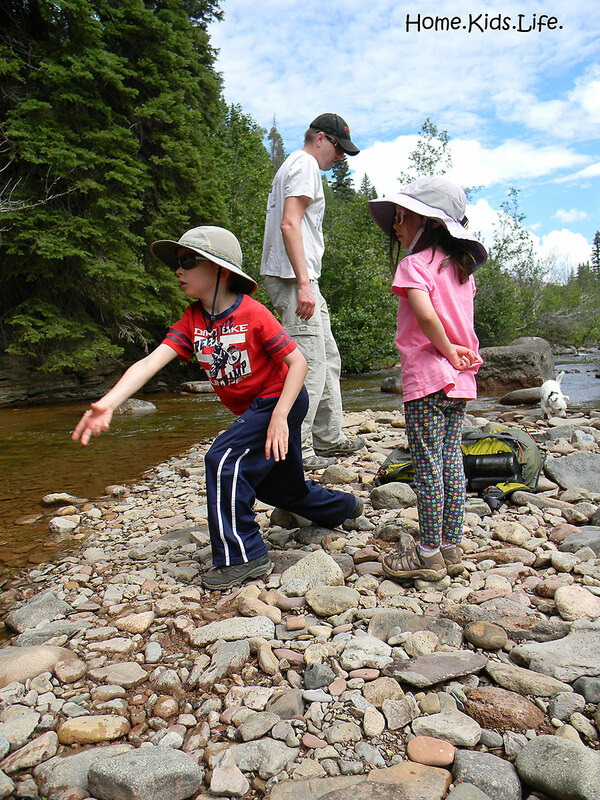 We hiked along the creek for awhile until we found an aweome spot near the river with rocks. Rocks + water = Fun for my family. Scooter improved his rock skipping skills and Chewy was finding rocks that looked like food to make a resturant. After enjoying the creek for awhile we hiked back and once again had to do the creek crossing. We had some wet children after that. I have no idea how they stayed in that cold water so long, they must have gone numb. On the way back down we stopped at the ski resort again. Since it was closed the previous day, we thought we would try and do the alpine slide as a family on this day. But there was a long line for it and we needed to be heading home. The kids did want to try the Bungee Trampoline and we let them. Chewy was 2 pounds over the weight minimum! She went first. 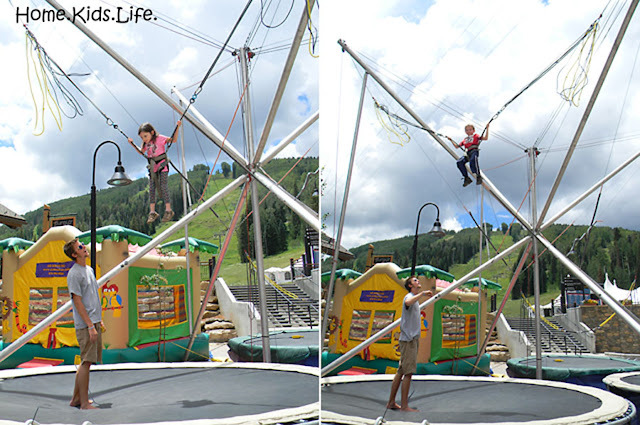 It was priceless to watch both kids, I wish I would have taken a movie of their entire jumps. Chewy didn't want to go really high. The bungee guy was really good about slowly working her higher and higher. She didn't really smile while she did it, but she said she had fun. She went really high once and told the guy, "I don't want to go that high again." She was really cute and really brave! Then Scooter was up. 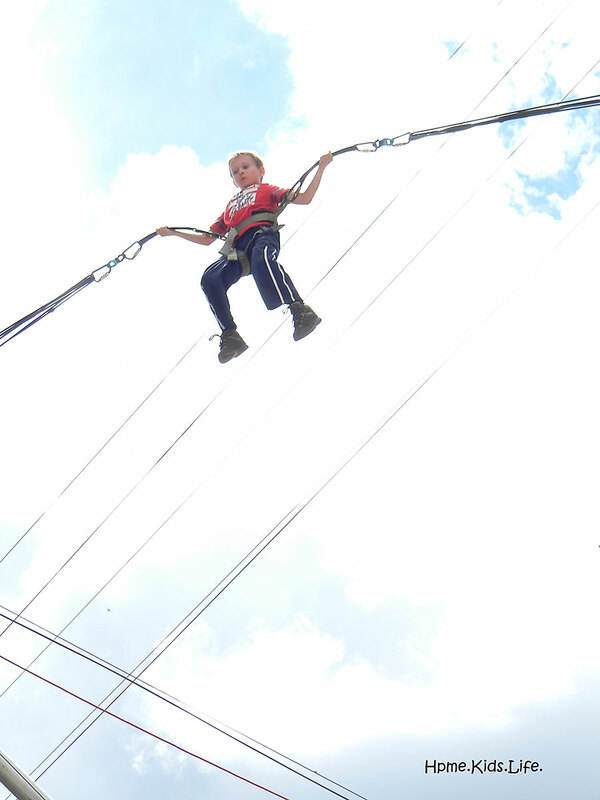 The bungee guy got him going a lot higher than Chewy went. The look on Scooter's face pretty much mirrored my face and what I must have looked like when I jumped off the cliff into water. He didn't smile at all either, but had fun. On his last jump he actually did a front flip. We could tell that he didn't mean to do it and came down with a stunned look on his face. That look on his face was priceless....kind of a what did I just do, I hope I didn't pee my pants, what happened look. Scooter only started smiling when we were all cheering. Now he tells us that he meant to do the front flip. Uh huh. Then the kids got to jump in an air jump house for a long time. It's hard tiring those kids out. And even then....they still had energy to spare. Whoa! It was a fun-filled, yet rainy weekend. We hope to make it back to Durango sometime in the future. I'm sure there are many more fun adventures to have there. Any suggestions for what to do when we go back? What adventures have you been having? Ride the train from Durango to Silverton. It's a beautiful ride.